In CQI, we have monthly challenges through year. 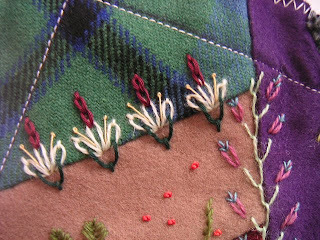 Last year we were so impressed by Gerry K's chellenge block she completed from 2009 challenges. This year lots of members are following her to make own challenge blocks. Me, too. 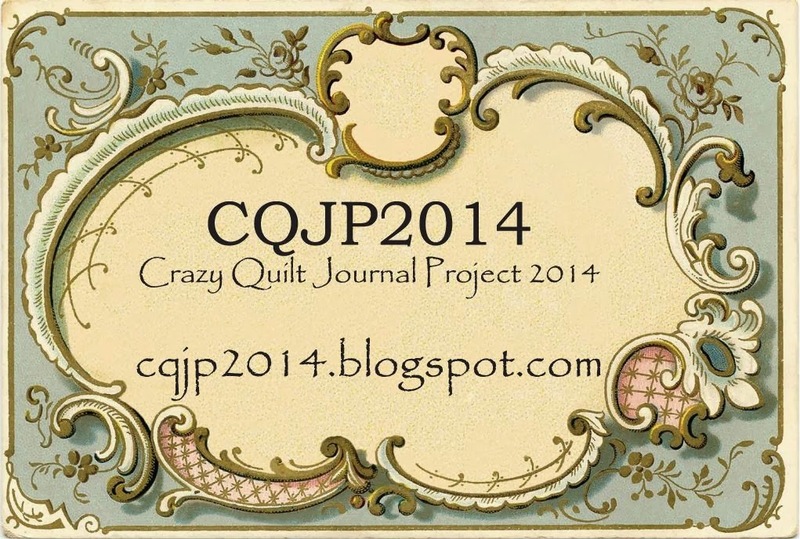 And here's my CQI 2010 Challenge block. I've done January challenge of "fan and curves" as well as February challenge of "using velvet". But I think my most biggest challenge of this block is colour. The bright colour of fams is definitely out of my comfort zone! Here's the finished whole block. 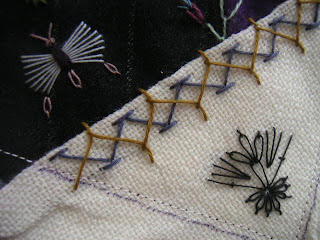 I made this block for curved piecing challenge of CQI two years ago. 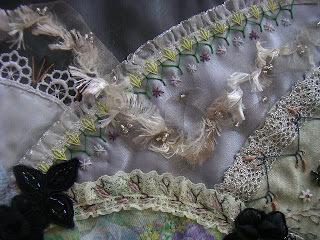 I don't remember what I meant to do with laces and trims on all seams. Anyway I've decided to finish this UFO now. I had named it "Winter Rose" before but I thought "Frozen Roses" was much better, only because it was very very cold when I started working. 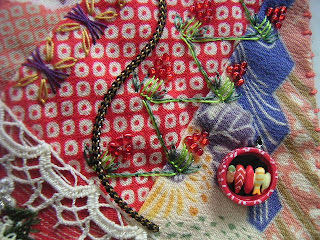 A butterfly charm and some beads are just put for test. Here's the block worked so far. I'll finish it tomorrow. New Year Days are ending now. Today we have bonefires of the seasons ornament in shrines. It's said if we warm ourselves by the fire would be healthy without illness in this year. Here's my AA page for Helina in Finlland. She used to stay and teach in Japan years ago. 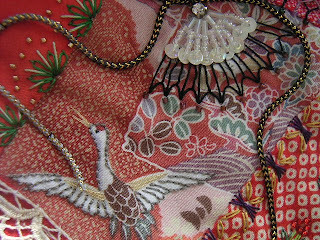 I thought she would like to remember Japanese Oshogatsu (New Year Days). 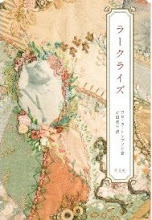 I added a haiku poem of Issa Kobayashi: "Medetasa mo cyugurainari ora ga haru". Don't you like this Sushi charm? 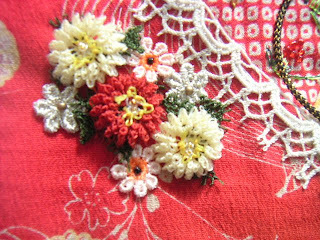 For chrysanthemums I used Oyas from Rengin Yazitas,Turkey. 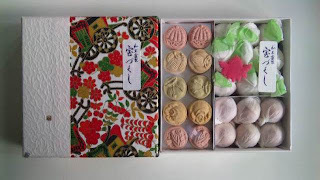 I received two boxes of Japanese sugar candy. It was a big pleasant suprise from my old classmate of elementary school. I remember the days we played together. And well, I would like to introduce a funny story between Kerry (a CQI list Mum) and me we have had. Here's her post on blog. Of course they are never soaps!! I commented then. Thank you for showing me these Hideko. 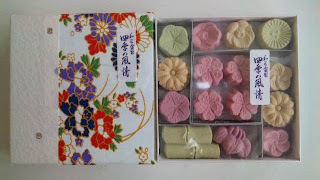 It is wonderful how lovely something as simple as candy can be - so delicately made and much too pretty to eat! Thank you again for solving my mystery. 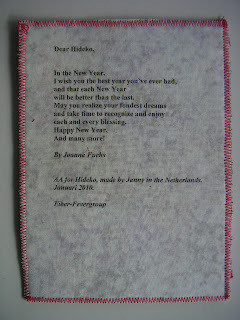 I received my AA page for January from Janny in the Netherlands. 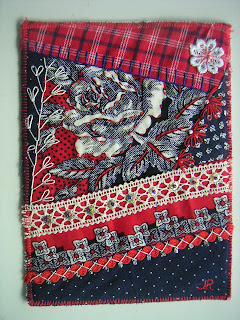 She made this beautiful page of a nice handkerchief in Dutch colours red, white and blue. 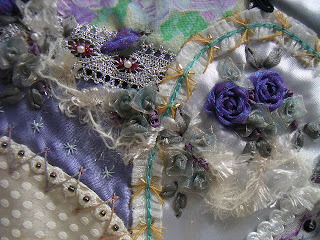 I love the big rose emphasized by her stitching. Thank you very much for your beautiful page with a poem by Joanna Fuchs. All Wool DYB RR of CQI started last month. I always received members blocks from Ritva in Finland. This is the first envelope with her own blocks. As everyone may knows, Tove Jansson's Mumin series is worldwide popular. Isn't it so cute? 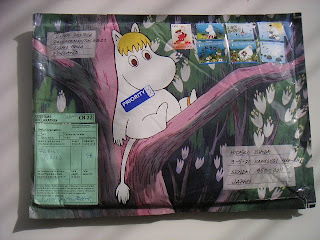 Though it's not so clear, postal stamps are also Mumins. The package was so lovely I took a photo before opening. This is the block I chose and started. 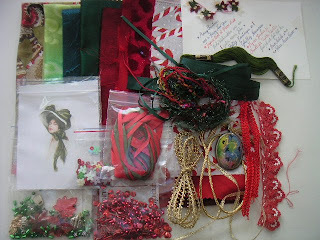 She wanted only stitching with threads if possible wool, not beads nor sequins. No SRE. Some buttons are OK.
Now I've found the colour combination she pieced for this block is very similar to the Mumin envelope. Don't you think so? I sometimes feel each nationality has own favorite colour from its cultural background. I wish you all a Happy New Year!! though it's a Japanese tradition we don't celebrate the new year days while we are in mourning. 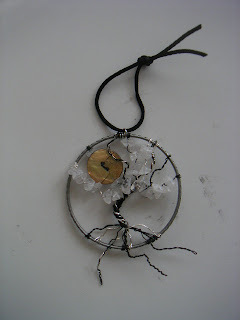 It's a big pleasant suprise when I received this "Tree of Life" ornament from Lynn Schoeffler in USA before Christmas. I have been waiting to show this beatiful gift until the first post of this year. Many things happened for me last year, not only good things but also sad things. "Tree of Life". Isn't it nice? I am encouraged. These beautiful block and baggie in season color were from Malla in Finland. She was my swap sister last year. Thank you very much for being my sister through the year, Malla. I love your baggie so much. Your color choice was always nice. I would like to make something from your each baggie in future. This almost naked block is from last year too. 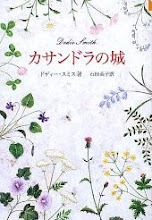 I would like to finish it in this year. Maybe it's one of my new year resolutions.